The artist must be the means, not the aim of art: an ambassador of principles greater than himself. -E.M. I do not pursue an artistic style to shock or to please the public with my subjective vision of the world. I pursue a language to express universal truths that cannot be communicated with words. -E.M.
Enrico Magnani (1972) is an Italian artist known for working with mystical and scientific themes aiming for the evolution of the human being. His first exhibition opened November 1997 in Milan. Until 2006 he worked as figurative painter and after a transition period his work has become exclusively abstract. 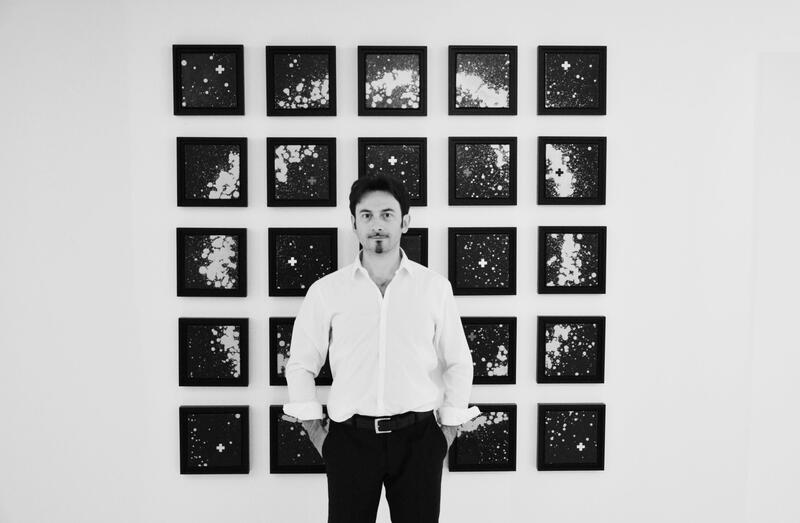 His original abstract artworks have brought him in few years to international attention and from 2010 have been presented in museums, foundations, private galleries, and public institutions in Europe and the USA. Among the most important personal exhibitions of the artist it is worth mentioning: "Harmonices Mundi" (2013) and "Magnum Opus" (2016) at the Italian Culture Institute of Prague; "Mystical Treasures" (2014) at the Museo Internazionale Italia Arte of Turin; “Cosmic Hug 4aWoman” (2015) at the Pinacoteca Ambrosiana in Milan; "Universal Flag" (2016) at ACS Gallery - Zhou B Art Center, Chicago; the retrospective "The Gold of the Earth" - One hundred works of the abstract period" (2017) at the Cloisters of San Domenico in Reggio Emilia; "Supernova - Birth to Life" (2017) at the Italian Cultural Institute of Chicago; "Supernova – Figurazioni Cosmiche" (2018) at the Sala del Cenacolo at the Chamber of Deputies in Rome.